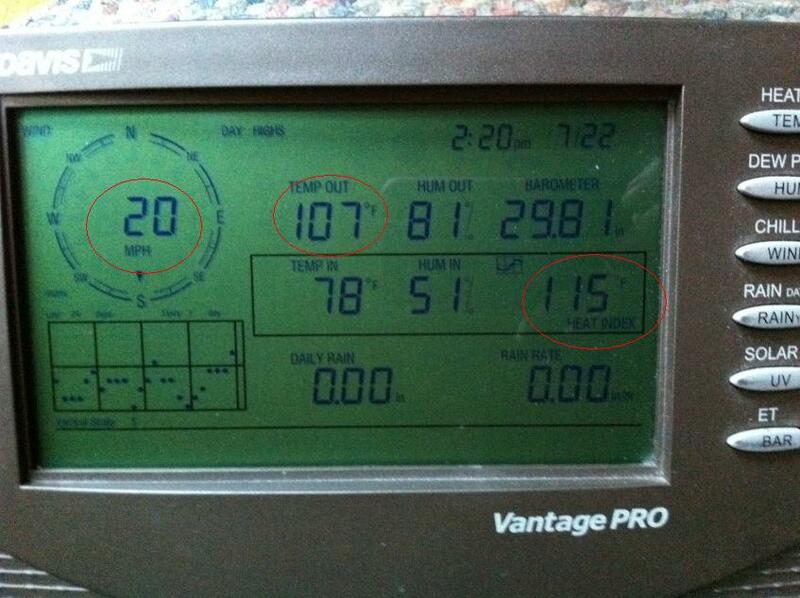 I took a picture of the “high” readings on our weather station for yesterday. For those not experiencing the heat dome in the US, let me tell you it’s hot! I circled three numbers. These represent the highest readings for the day. These did not necessarily happen at the same time though I think two of the three did happen at the same time. Highest wind reported was 20 mph. Really? It must have felt like a convection oven. Highest outdoor temperature was 107F. Highest heat index was 115F at 2:20 in the afternoon. I am pretty sure we set some records here but I’m also pretty sure we didn’t have the highest temperature or heat index in the country. I love this weather station. Up North, I didn’t try to fry eggs on my forehead, but I am sure I would have been successful.. Aftrer the rain, lightning, and thunder came, it took 3 hours to get the inside of the house cooled down. .
That is just crazy hot. I have been following the temps that some of my family has in Oklahoma, and I just can’t believe how hot it has been.